If you have to deal with carpet cleaning on a regular basis, this Rocco & Rosie carpet spray will come in handy to you. Its formula contains natural enzymatic bacteria that get activated as soon as they are applied to the stain or place with odor. The detergent starts feeding on ammonia crystals as well as organic matter to achieve full elimination of stains, odor, and residue. This professional strength spray does not contain chlorine. And is absolutely safe both for children and pets that is confirmed by legitimate certificates. You can use it on different surfaces including carpets, floors, plastic, and fabric and be confident that their perfect look and bright color will not be influenced by the formula. Moreover, its safety for carpets has been approved by a trusted carpet and rug institute (CRI) too. Forget about any stains and odor of organic and natural origin with this carpet cleaner spray and feel that your family members feel fresh and safe. The application of the spray can result in changing the original carpet color if there was pet urine (in fact it could be urine that has changed that). Many people who have tried this carpet cleaning spray tell about its miraculous power to remove tough stains and bad odor from carpets and other surfaces. Free from residue you need to spray on carpet cleaner that you vacuum up and get an absolutely clean area without any smell. Stains and odor are also a positive environment for bacteria growth, that is why it is not enough to remove then to get rid of the detrimental microorganisms. 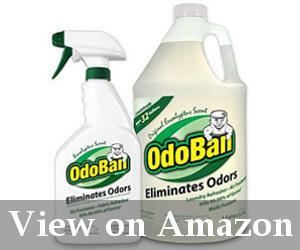 This OdoBan spray is not only an effective odor eliminator but also a sanitizing, disinfecting and deodorizing liquid. It kills 99.99% of germs after the first application and can be used for many different purposes. Whether it is a pet odor or the unpleasant consequences of the flood or fire, organic odor or garbage areas, it is enough to apply this clear carpet cleaner spray with an original eucalyptus scent and your upholstery, carpets, floor or wall will become absolutely safe for living again. The antibacterial carpet cleaner spray is sold as a combo pack: there are a ready-to-use trigger spray bottle and 1 gallon of concentrate that can be transformed into 32 gallons of the solution to use. As a result, you get a fresh and non-residue cleaning solution to be used for long months. Are you tired of any unbearable scent in your home? OdoBan can help you to forget about the odor that does not want to leave your home. Its unique carpet cleaning formula is incredibly effective against any bad smell and moreover, it kills all the detrimental microorganisms and bacteria to make your home a safe place of living. 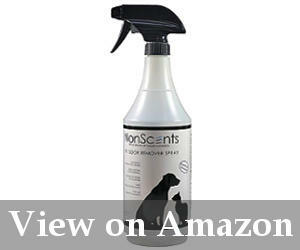 Removal of pet odor can be a challenging job unless you buy this miraculous formula from Non-scents. It is one of a few carpet cleaner sprays that does not mask the odor with another fragrance but kills it thanks to a professional formula used. The odor compounds are destroyed at the molecular level unlike many other products based on baking soda or enzymes. The scent-free formula is not only highly effective but also absolutely safe and biodegradable. There are no harmful chemicals, so either you or your pets are in absolute safety. The procedure of using this carpet cleaner spray is very simple. It is enough to spray the liquid on the spot that releases odor, leave it for half an hour and remove all the remaining liquid. The organic odor can be removed from multiple surfaces in this way including upholstery, carpets, clothes, pee pads and trash cans. Forget about the odor coming from litter boxes and their contents by deodorizing them with this powerful scent eliminator. It is 10 times more powerful than its closest competitors so the effect is undoubtful. Destroys odor only, not stains. It is difficult to find an effective odor control liquid with a long-lasting effect, but Non-scents managed to produce a carpet cleaner spray that copes with this task 10 times better than its closest competitors. Remove odor instead of replacing it with another fragrance using this powerful and safe formula. Stains are one of the toughest problems of carpets, fabrics, and upholstery so this aerosol for cleaning carpet from Chem-Dry can be a good assistant in this responsible task. The stain remover copes with most water-based spots effectively after the first application. It is enough to press a button and a power of carbonation will lift the stains to the carpet surface for you to remove it quickly. One more huge benefit of this carpet cleaning spray is green certification. You can be confident that is absolutely safe for every member of your family including pets as there are no toxic and harsh solvents. The surface it is applied to remains clean and undamaged too. Forget about dirt and such apparent food spills with this effective aerosol to get a fresh and good-looking interior between cleanings. You need to get used to the trigger using. If you can not decide what to choose spot shot vs resolve carpet cleaning liquid, you should remember that tough stains can be removed only with such powerful spot carpet sprays as Chem-Dry stain remover. It has proven its efficacy for dozens of years and is chosen by many people because of its safety and power. Rolex is a company with 40 years of carpet cleaning experience so its products stand out among other competitors. You can be confident that this liquid will not influence or change the color of your carpets, upholstery, floor, and walls, but you will get rid of annoying stains quickly and easily. No need to rinse or vacuum. Some spots not indicated on the label can leave auras after their removal. 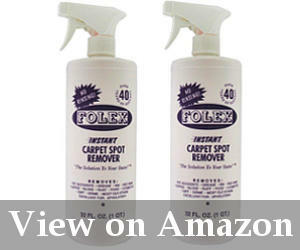 One of the top-rated spot remover Folex is a finding for many households. It provides a perfect instant result removing any stain of the origins mentioned on the cover, so you can be confident that your efforts will crown with success thanks to this great carpet cleaner spray. In addition, you get 2 bottles instead of one, great, isn’t it? No matter how much you love pets but a necessity to clean after them may drive mad sometimes. That is why you must have a reliable carpet cleaning assistant like a stain remover for Natural Rapport. This spray has been created especially for pet owners. Its formula includes only natural ingredients and no harmful chemicals. Thanks to the natural bacteria contained there all the stains of organic origin can be easily removed, while the place of the stain will be safe for both kids and pets. The basic ingredients of the formula are enzymes and other derived from plant substances. That help not only in cleaning carpet stains but also eliminating the odor. It will cope even with old stains and odor leaving your carpets fresh and tidy. In addition, it does not leave any residue afterward. The company offers at 100% satisfaction guarantee to everyone, whose experience of using the carpet cleaner spray was not successful. The solution can not be used on wood furniture or next to food. 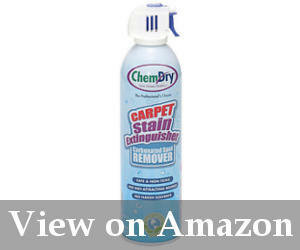 If you do want to get a carpet cleaning spray that works, this solution from Natural Rapport is one of the better ones. It is one of a few liquids that removes stains and eliminates odor leaving a pleasant and light fragrance. In addition, its natural ingredients and absolute safety make it number one choice for pet owners. Not all products created for a home are as effective as ones used by professionals. 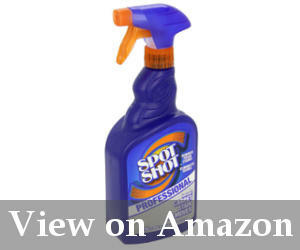 This stain remover from Spot Shot was created for a professional use so even very tough and old stains are not an obstacle for its powerful formula. It is enough to spray this carpet cleaning solution on the stain. And it will instantly remove it. There is no need to scrub, rub or vacuum it. As the solution copes with its task perfectly. It can be safely used on carpets, rugs and different fabrics. Special if they were stained by such liquids and substances as motor oil, pet urine, coffee, lipstick, red wine, and many others. 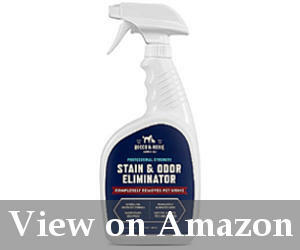 In addition to carpet cleaning, this spray deodorizes the stain and prevents them from appearing again. Blot the stains away using professional cleaning power that kills stains and neutralizes odor. Suitable for tough and old stains. If DIY carpet pretreatment spray or any other solution can not remove a tough stain, it is time to purchase a professional Spot Shot carpet cleaning spray. Suitable for a variety of stain types it works effectively and quickly thanks to its professional formula created especially for carpets and rugs. Today there is no need to look for the good spray and vacuum carpet cleaner. It is much easier to avoid using a vacuum and apply an all-purpose cleaner from Better Life to the stain to remove it. The main reason that prevents people from using professional carpet cleaner sprays is their chemical structure. So Better Life brand decided to create a green and absolutely safe natural solution for carpet cleaning. The formula consists of plant-derived products, is scented by natural plant oils or is absolutely unscented. It means that it is safe not only for children but is also environmentally friendly and biodegradable. Even a package of these carpet cleaning sprays is recyclable and packaged using solar energy. The carpet cleaner is safe and effective for a variety of surfaces including toilets, appliances, walls, automotive and recreational equipment and even toys. It can easily cut through any grime, grease, stains and serve as a pre-spotter for a laundry. Turn the nozzle to ‘on’ position and start your fast, effective and easy carpet cleaning with this fascinating solution. A bit soapy and bubbly. Why should you prefer a clear water-based spray to the super foam carpet cleaner? Looking at this product of Better Life, you understand that modern effective carpet cleaning solutions can be absolutely safe and provide no residue. In addition, there is no need to remove the solution, so your carpet cleaning is easy and fast. Resolve brand is one of the leading manufacturers. His offers spray and vacuum carpet cleaner solutions for different purposes. This spot and stain remover is produced in the form of a spray. And most importantly, has been created to struggle with tough stains and unpleasant odor. The formula of the carpet cleaner spray can penetrate very deeply to remove the stains fully and only for 30 seconds. No matter, if it is a spot from your make-up, food grease, dirt or a stain caused by coffee, pet or oil, this carpet cleaning solution will do its task perfectly. Gets soapy if mixed with water or scrubbed. What makes a perfect carpet cleaning spray? Of course, it is effectiveness and double effect. This Resolve solution to keep carpets clean removes both odor and the toughest stains quickly and efficiently. It is enough to spray the liquid, wait for 30 seconds and wipe it off to finish the war with set in stains. Some people think that every cleaning solution you spray to the carpet must be removed with a vacuum or steamer. If you also believe in this, choose a carpet pre-mist cleaner from Capture brand. It is an effective non-solvent spray for a pretreatment of tough stains and their further removal using modern home appliances. The carpet cleaner spray loosens not only dirt and grime but also smell and allergens. It is one of a fire sprays that can be used by people suffering from allergies. It can be used every 8 weeks to remove allergens at home. The product is safe for children and pets. Having a good quality it is produced in the USA and offers a full refund to everyone who was not satisfied with the result. Sold as an addition to a dry cleaner. Do you believe that old spots, stains, and odor can diminish from the rug? Try this best carpet cleaner spray from Capture brand and you will be surprised. It works effectively as a pre-treatment spray. But large dirt areas can be removed in this spray in combination with a dry cleaner. People got used that often floor and carpet cleaning formula is produced by the same manufacturers that sell vacuums and steamers. In fact, there is Bissell carpet cleaner spray or ones from other companies that produce vacs. But it is important to remember that these companies major in producing home appliances, not cleaners. That is why it is better to choose a carpet cleaner spray that is both safe and effective from the companies that put their all efforts into one direction – clean carpets and other surfaces. You can see a variety of carpet cleaning sprays in the modern market. However, to find the one suitable personally for you it is important to analyze several features of the product. 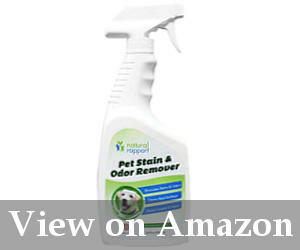 It is a spot, stain or odor removal spray (or a combined one). Types of spots and stains removal of which is effective. The capacity of the bottle. Safety for pets and kids. Ingredients (of natural or chemical origin). Time of work (instant removers or ones that should be left for some time). Fragrance (with fragrance or non-scented). Unfortunately, there is no one universal carpet cleaner that could do magic tricks on every rug. However, we have chosen top 10 carpet cleaner sprays. That have proven their great cleaning efficiency. Consequently, will be great assistants in stain, spot and odor removal. 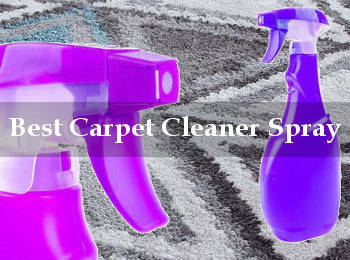 It is better to buy trustworthy products from this top-rated carpet cleaning sprays. Than waste money on multiple products that might not gig a desirable effect.